PERI Asia Pte Ltd is pleased to be a part of the Safe Hands Campaign that was organized by the National Workplace Safety and Health Council (WSHC). 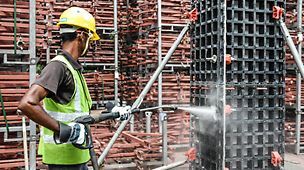 The campaign brings into focus on taking preventive measures when working with machinery so as to avoid hand and finger injuries. 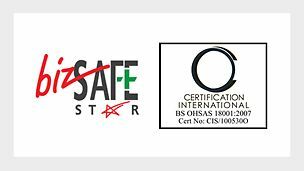 Similarly, we have also re-certified both OHSAS 18001 and BizSafe Star. Both certifications convey the same message – achieve measurable improvements in safety and health standards at the workplace. Sole4Souls is a non-profit social enterprise that creates sustainable jobs and provides relief through the distribution of footwears and clothing around the world. This year, together with Million Lighting, they hosted their 3rd Shoe Drive. With all the donated footwears, they are able to resell them and profits will be given to the charity. Not wanting to miss out on this opportunity and with a big heart, PERI Singapore staffs took part in this Shoe Drive Donation. Over a period of 3 weeks, we were able to collect a huge amount of donated footwears. This is definitely a great news to share. With this good cause, hopefully every little things that we do could bring a smile to someone who is in need. Once again, thank you to our staffs for their great generousity. We see ourselves not only as a providers. Instead, keeping a close eye on the business of our customers, their benefits and added value is our top priority in everything we do. 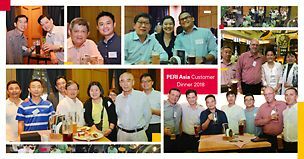 On the 6th of March, we held a casual PERI Asia Customer Dinner 2018 over at Paulaner Bräuhaus Restaurant. 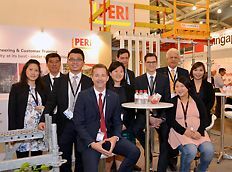 Together with our invited customers, PERI GmbH Group Managing Director responsible for Sales, Mr. Alexander Schwörer, was also present. Summing up the dinner were a night of appreciation and catching up with one another. Even so, we would like to thank our customers for spending their valuable time to be with us. 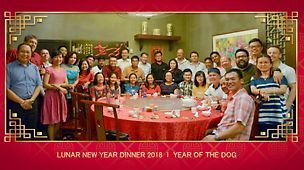 On the 23rd of February, PERI Singapore Staffs together with colleagues from PERI Asia Market Unit (Asia Pacific) had a Lunar New Year dinner just in time to welcome the Year of the Dog. With a night full of toasts and gourmet delights, everyone had a really good time. It was a night of fun and great company indeed. 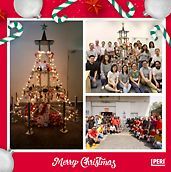 To get into the festivity mood this Christmas in PERI Singapore, every staffs work together as a team and erect our very own PERI UP Christmas Tree both in our main office and stockyard. A creative way to use our PERI materials and this is definitely a great way to mingle with one another during this jolly season! 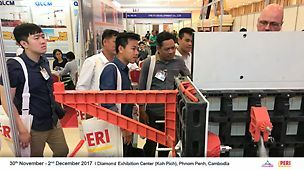 PERI Asia Pte Ltd participated at the Cambodia Construction Industry Expo 2017. It is a 3 day exhibition being held from 30th Nov to 2nd Dec 2017 at Diamond Exhibition Center (Koh Pich), Phnom Penh, Cambodia. It is an exhibition for us to showcase our PERI systems - DUO & PD 8 Table - to the Cambodia market. Customers are also part of the driving force of a business. Building a strong rapport with them is imperative to the success of the company. Hereby, we are pleased to share that PERI Asia has been accorded with a Business Partner award during Woh Hup’s Business Partners Appreciation Dinner 2017 that was held last Monday evening. 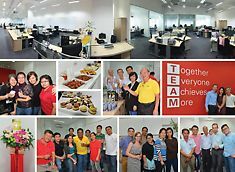 On behalf of PERI Asia, we would like to congratulate Woh Hup (Private) Limited on their 90 years in the industry! Just like any other year, this year our half-yearly stock take was carried out on the 27th and 28th of July 2017. Divided into teams of 2, with a total of 24 persons counting to cover our stockyard, it turned out to be a great success with majority of the 1st and 2nd counts completed by the end of the first day. The whole event created a good camaraderie among our colleagues with the involvement from the management, office staffs to the stockyard workers. With good teams incorporating teamwork into their performance, this makes our stock take event a success! 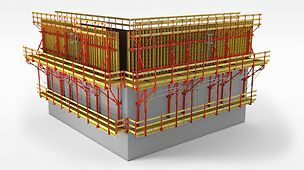 We are proud to announce that our PERI CB 240 Climbing Formwork system is officially under a Band 2 category for its vertical formwork system in Singapore Building & Construction Authority (BCA)'s Buildable Design Appraisal System (BDAS)! The Buidable Design Appraisal System (BDAS) was developed as means to measure the potential impact of a building design on the usage of labour. With regards to PERI Asia's 25th Anniversary the company has organized a health screening day for all employees on 17th June 2016. The Customer Training Centre at 1 Sims Lane has been converted to a temporary surgical ground for use. 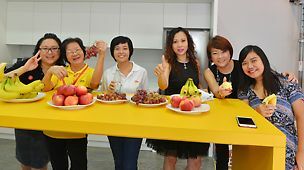 Fresh fruit were made available for participants to consume after their health screening. 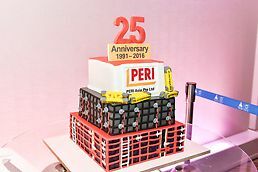 In celebration of PERI’s anniversary employees and their families enjoyed a day of fun activities at Resorts World Sentosa including a visit to Universal Studios Singapore. The celebration was rounded by a dinner at Mount Faber. Everyone had an unforgettable time. 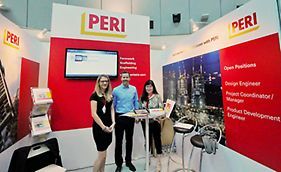 PERI Singapore has participated at Myanmar’s Leading Building Technology and Supply Event. A highlight of the exhibition was the opening of our Yangon training facility where we train and certify our customers’ staff to meet the standards set by the Building Construction Authority of Singapore (BCA). 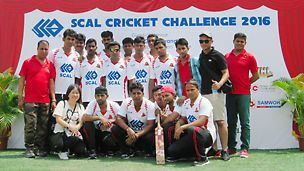 The Singapore Contractor Association (SCAL) hosted a two-day cricket tournament on 1st and 2nd May 2016 to celebrate Labour Day with migrant workers at the SCAL Recreation Centre. 23 teams form SCAL member construction companies battled in 22 rounds of tightly fought matches. 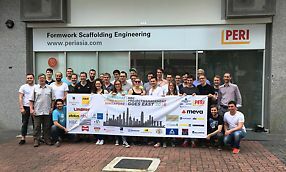 PERI Asia Pte Ltd has been welcoming students of ‘Biberach University of Applied Sciences’ during their final excursion to Shanghai, Hong Kong and Singapore before graduating. 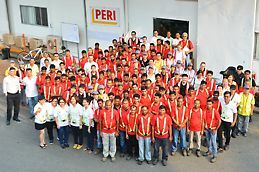 They have visited several projects in Singapore and got introduced to PERI Systems. The students have enjoyed their stay and gathered valuable experiences for their future career. We wish them all the best for their final exams. We successfully held our first career fair at two renowned universities in Singapore, the National University of Singapore (NUS) and the Nanyang Technological University (NTU). The fair provided us a good platform to interact with the graduates/students, giving them a better understanding about PERI’s value. We are glad with the overwhelming response and we thank those who dropped by at our booth. 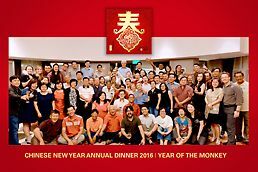 PERI Singapore l Welcome to the Year of the Monkey | CNY Dinner 2016. The evening was accompanied by a nine-course meal and ended with a lucky draw. In between our management paid tribute to team members with a long-service award. Highlight was the presentation of the ‘PERI Asia Star Award’ to our 2 most popular colleagues. In all it was a great night and everyone had a really good time. It was a night of recognition and fun, honouring all for contributing their hard work during the past year. Biz Safe Star & OHSAS 18001:2007 certification which is a further step to assure the highest Safety Standards for our customers and our team. PERI Singapore l Together with their partners all PERI Singapore colleagues were invited to participate with some other 25,000 people to join the SG50 Jubilee Big Walk on 29th November 2015. The walk through the heart of Singapore took place on a permanent 8 km long commemorative trail, known as the Jubilee Walk. This trail connects more than 20 historic and iconic locations within the Civic District and Marina Bay precinct. As an appreciation every registered colleague was invited to join in for lunch afterwards which turned out to be a pleasant afternoon to end the walk. 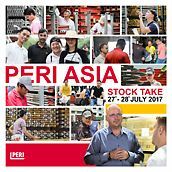 PERI Singapore Stocktake 2015 l Our annual stock take was great success as it took us a shorter time compared to last year, with one day for the stock take to be carried out in full-force. We were divided into teams of 2, with a total of 20 teams of 40 persons counting, covering 2 stockyards. The whole event pointed out to be a great teamwork success with the involvement from the management and the office workers to the stockyard workers. We rounded up the day with a barbeque for everyone to join, which made it a nice evening! We are happy to announce a strategic partnership with one of Singapore’s leading construction companies. This alliance leverages on the extensive technical know-how of both companies to create value-added services to the local construction market in our common efforts to raise productivity on the construction sites. 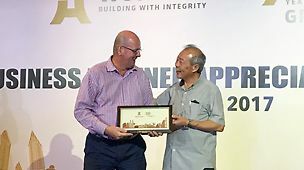 The Memorandum of Understanding was signed during the Singapore Construction Productivity Week witnessed by the board of the Building and Construction Authority (BCA). PERI Asia Pte was participating at BuildTech Asia 2015 which is Singapores leading trade show for the building and construction industry. We are thrilled to announce the opening of our recently enlarged office at 1 Sims Lane. The spacious layout will make a very important contribution to our growth as a company. Modern workplaces without barriers allow us to provide the highest service level to our customers and to continuously grow as a team.